A bit of ‘go’ is something you’ll doubtless look for when buying a car, and seeing exactly how a car behaves when you bury your foot in the carpet is something many will do when test driving potential purchases. Indeed, some people will rank performance very high up on their list of priorities when buying. However, you don’t have to be a millionaire to buy a speedy set of wheels. Here’s a list of the ten cars under £20,000 which are quickest to 60mph (or 62mph). It might a surprise to see this relatively big car in the top ten, but with 150bhp, a 0-62mph time of 7.8 seconds and a list price of £17,120, it ticks all the boxes. It has a pretty high level of standard equipment, too, including satellite navigation, Bluetooth and USB connectivity. It’s probably the best all rounder in this list. 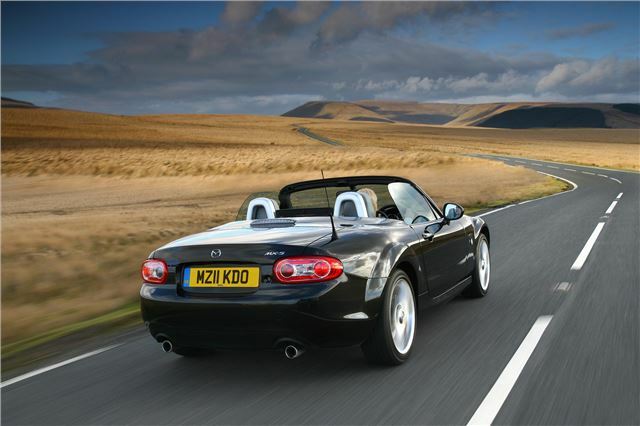 The only two-seat rear-wheel drive car in this list the MX-5 is also the only cabriolet in our top-ten. Capable of a 0-62mph sprint in 7.6 seconds the MX-5 is sure to raise a lot of smiles. Its forerunners are destined for classic car status and it has a cult following, so if you’re looking for a traditional sports car rather than a hot hatch, it’s the only choice. The 2.0-litre SE comes in at £18,785. It used to be called the cloverleaf and technically it still is, just in Italian. Alfa Romeos wearing the green Cloverleaf badge have always been at the top of their range, and this is no exception. With 170bhp powering the front wheels via a six-speed manual gearbox, this MiTo isn’t a slouch. It’ll hit 62mph in 7.5 seconds, costs £17,995 and has a top speed of 136mph. The cheapest car in our list, the Colt Ralliart is only £13,949, and it’s got an incredibly addictive turbocharged engine, a bit like a mini Lancer Evo. It’s not much like an Evo to sit in though, with a curiously high seating position and heavy steering. Still, it’s exceptionally speedy for such an inexpensive car, with 147bhp propelling it to 62mph in 7.4 seconds. In such a non-descript package it certainly raises a few eyebrows from other road users. The DS3 is wonderfully likeable, stylish, well put together and well equipped. It’s a difficult package to pick fault with, which is probably why it’s been such a success for Citroen. The top-of-the range DS3-R misses out on the top ten thanks to costing more than £20,000, but the 150bhp THP engine in this model is more than enough to raise a smile. £16,610 gets you 0-62mph in 7.3 seconds, and nimble, direct handling, making it worthy of recommendation. It might share its 0-62 sprint time of 7.3 seconds with the DS3, but thanks to a list price £195 lower than the Citroen it ranks higher up our list. It’s the first of three cars in the top ten which are powered by the Volkswagen group 1.4-litre twin charged engine, and it’s also the cheapest of those three. Most of the differences are superficial, so if you want the pleasure of a supercharger AND a turbocharger for the lowest price then it’s the one to pick. A close relative of the Fabia vRS, the Ibiza Cupra comes with the same 180 horsepower engine but is 0.1 seconds faster to 62mph. It’s got a much more youthful image than its stable mate, though, particularly in Bocanegra spec, which makes gives the Ibiza a menacing, aggressive appearance care of a re-trimmed interior and black painted front end. At £17,645 it’s quite a lot more than the Skoda, but it’s still a hoot and it’s very pretty indeed. A firmly established favourite, the Cooper S is a common site almost everywhere you go, and it’s not difficult to see why. It’s endlessly customisable, cute, handles fabulously and is quick of the mark thanks to its 184bhp turbocharged engine. At £18,015 it ranks amongst the most expensive of the top ten, but with strong resale values it’s not bad value. The most expensive of the three twin-charged cars feature, the Polo GTi is also the most well built, with a higher quality cabin than the other two. It’s also a little bit quicker, but 0.3 seconds is hardly going to make a massive difference in the real world. Then again if you like to quote figures and be the absolute best, this is the only choice in the trio. The three-door costs £18,795. If you want to go fast and have fun then most people will suggest a Renaultsport Clio. 200 horsepower, 214Nm of torque, 144mph... it’s got some impressive numbers. And while it has the same 0-60mph sprint time as the Polo GTI, it’s got a couple of advantages over the Volkswagen – a proper manual gearbox and a list price of £16,930, almost £2,000 less than the Polo. It’s easy to see why the Clio places first in our list! If you’re after a tiny, high performance car, a big load lugger or a simple, economical runabout, check our data section for facts and figures almost all the cars on sale today.